Home Cricket Articles 15 years old Pranav Dhanawade creates history! 15 years old Pranav Dhanawade creates history! Pranav Dhanawade creates history. First man to score 1000 runs. 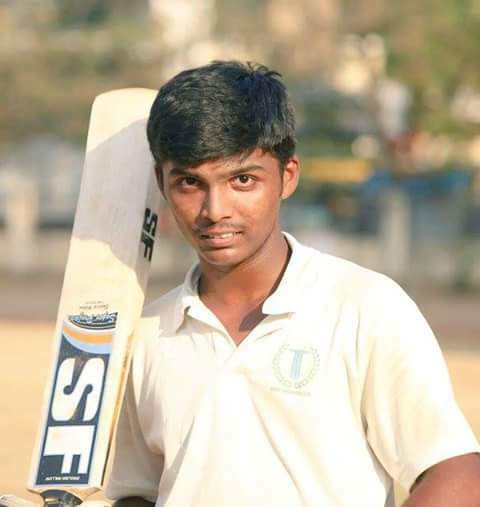 Pranav Dhanawade smashed the record books when he became the first batsman in history to score 1000 runs. He achieved this feat playing for K.C. Gandhi School during the H.T. Bhandari Cup inter- school cricket tournament conducted by Mumbai Cricket Assocation (MCA). He scored 1009* in just 323 balls against Arya Gurukul School with a straggering strike rate of 312.38 with 59 sixes and 129 fours. K.C. Gandhi School declared the innings at 1465/3. He had scored 652 runs on Monday, already beating the world record score. The team had to announce declaration to stop this marathon innings. Never before, and probably never again has someone scored 1000 runs in the decorated history of cricket. This is a remarkable feat considering the strike rate and testing conditions in which he scored. Pranav Dhanawade, the son of an autorickshaw driver beats the record earlier held by Arthur Collins. Collins was the record-holder since 1899 when he scored 628 for Clarke House in England. The Indian record however, for the highest individual scored was held by Prithvi Shaw when he scored 546 in a Harris Shield match two years before. Before this match Pranav had nothing in mind, but now he is keen to be selected for the Mumbai U-16 team, but one can say with the right attitude and temperament he could be the one for the future. Amazingly, these Mumbai youngsters have a habit of scoring big, for they have set the ‘maidans’ ablaze in the past as well. In 2010, known as the Ranji Bradman, Wasim Jaffer’s nephew Armaan Jaffer scored 473 who overtook Sarfaraz Khan’s 439 scored in 2009-10 season. It was in a similar Harris Shield tie that the duo of Sachin Tendulkar-Vinod Kambli pair made a 664 run partnership for Sharada Vidyamandir in 1988. Sachin had scored 326 while Kambli made 339.The rest what happened in Indian cricket was history. Sachin Tendulkar went on to be one of the best batsman, if not the best in Indian cricket. Vinod Kambli too turned out to be a successful and dangerous test batsman. There is a rich legacy in Mumbai cricket, it has some of the finest names in Indian cricket and young Pranav has exactly set the foundation for a scntillating career. If he is able to atleast half of what the little master did in a span of 24 years, it would do India a world of good and write down his name in the annals of history.